Take a look at my Tyne sunset photo, so mad to think that I took this just as I left work. In another few weeks it'll be getting dark in the afternoon and then we really are on the countdown to Christmas. EEEEEEEEEEEEEEEEK! This weekend has been a bit of a foodie fest, Simon's Mum came up to the North East to celebrate her special 60th birthday and we treated her in our favourite way, by spoiling her with yummy food and drink. I'll be sharing more about that later on this week so for now I tease you with a Starbucks caramel hot chocolate which I had on Friday. I'm definitely more of a Costa girl (with the exception of Christmas time when eggnog lattes in red cups tempts me to switch sides) but as we had a little wait for Simon's Mum we ventured in and I found myself loving my hot chocolate and wanting to go back some time to try a Duffin. 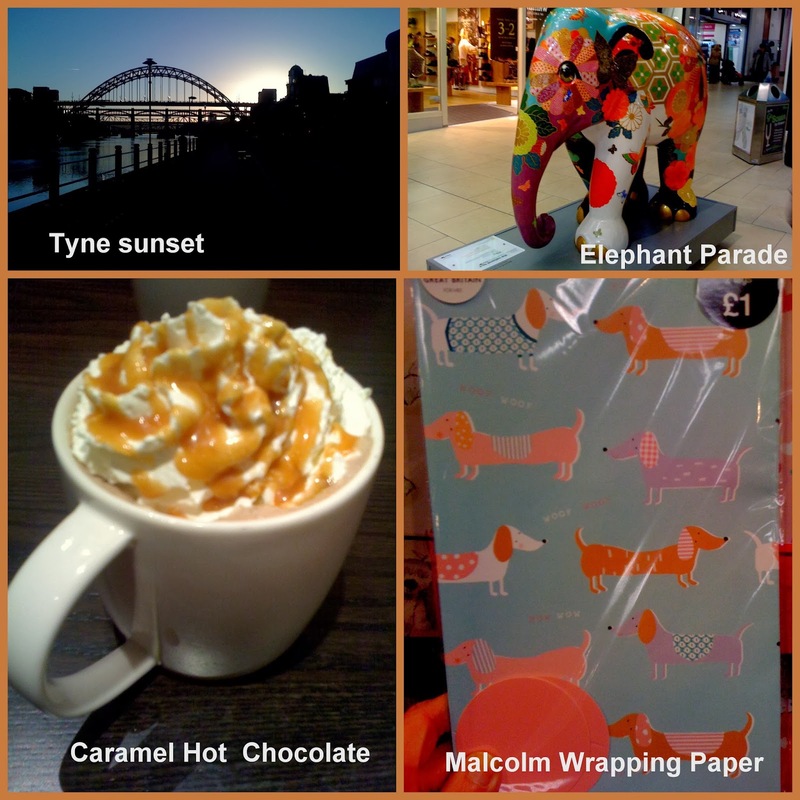 The Elephant Parade has arrived in toon. I was pretty excited by this when I first heard the news. I was living in London when the elephants paraded into the capital and had the most amazing time hunting them all down, I walked miles and discovered new areas that I'd never ventured into before. Unfortunately this time I've been left a little disappointed as the elephants are only in Eldon Square so no exploring for me. Still, they brighten the mall up and it was nice to see them again as I stormed through the shopping centre on my lunchtime errands. I'm not sure I've mentioned our future dog in this blog yet so it may be about time I introduced you to Malcolm. My family have always been cat people and I've never really spent much time around dogs, however when my friend Paul moved into a house with two loveable Chihuahuas I began to appreciate little dogs a lot more. Simon is adamant that he does not want a Chihuahua but after discussing various different breeds of dogs we've both agreed that we'd like to get a miniature dachshund just as soon as we've bought our own place, we've already decided we'll be calling him Mal and I honestly can't wait to finally meet and take care of him.